"I need my PC to control my process, acquire the data, store and graphically present my results. I want do my projects faster and more efficiently." Do your projects faster. The MHI Data Acquisition and Control Software offers unparalleled control and data management many MHI devices, including Furnaces, Robust Radiators, Thermoplates, Airtorch™ and Microheaters. It is powerful enough to remotely turn ON/OFF your MHI furnaces, download data, create cycle programs, provide graphical analysis and monitor and manage up to 12 MHI heating devices. DACS software is simple to use and easily connects to your COM/serial port with no need for additional hardware. DACS2 offers the advanced built in data acquisition system combined with PID control. DACS1 or 2 depending on required control features. Equiped with temperature recorder. Will record files that may be coded to record part -number, lot number and date during the process (requires user interaction to determine the numbers). Electronic Recorder unit read only data can be set to network drive. The recording system ssupports protection, retention and retrieval of accurate records throughout the record retention period. Reliable world standard hardware. Multi levels of password protections are allowed. The compact ¼ DIN controller offers four universal inputs for data recording and two PID control loops with a full color 320x240 pixel graphical 3.5” TFT display for a crystal clear operator interface. Configurable real time views including horizontal and vertical trends, Horizontal and vertical bar graphs, Alarm status and control loops. Up to 30 additional virtual channels can be utilized to provide different functionalities within the instrument. Optional Dual programmer supporting up to 100 programs with 25 segments each. Ethernet communications with Modbus TCP or FTP protocols for communications with third party software. Like Labview and other software. Built in 50MB of non-volatile flash memory for data storage. Automatic data archiving to a removable USB memory stick or FTP to a secure data location through the built in Ethernet port. USB Connections. Use with Dongle to make Wireless. Single or multiple furnaces/zones (up to 12) may be controlled and monitored as shown. "I need my PC to monitor my process, save data and graphically present my results with MHI-DACS. I just upload the profile or parameters and record the temperature and output. Download the data in the morning from the saved file." "The start time, stop time and sample rate allow me to record data as and when I like." Program new cycles and download remotely. Upload programs and remotely execute cycles. Choose from over 70 heat treating processing profiles for ceramic, metals and many others. Download programs from controller to PC. Save profiles to file on PC for later use without the need for a multi-program controller. 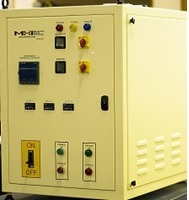 Multi-furnace programming is possible up to 12 controllers. 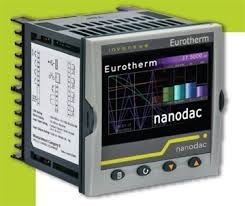 Monitors and records set point, process and output values from the Eurotherm process controller. Displays values from 12 different controller addresses. View data in an Excel table with date, time, sample time, process, set point and output values. Review saved data files in a graphical form. Remote furnace ON/OFF will turn furnace ON/OFF from your PC.